The anthology of learned articles titled as ‘Dharma to the UK’ edited by Mahinda Degalle and published by World Buddhist Foundation (2008) reached me when I was researching into people and events linked to the spread of Buddhism in other countries. Undoubtedly this collection of essays printed by the All Ceylon Buddhist Congress proves that much more could be discovered. The crosscurrents, turbulences and the conflicts are shown in various forms such as Vesak illuminations, pandals, and dansals providing food to passersby. The Vesak reading too had become part and parcel of our culture. Since my childhood I had the habit of having access to various kinds of Vesak annuals. The intention of these publications, I suppose, is not at all a profit-making venture. Instead a merit gathering process where good Dhamma or teaching material pertaining to Buddhist philosophy and living is distributed. This time though I had access to various kinds of Vesak literature, inclusive of Daily News Vesak annual Buddha Pradeepa, I devoted more time reading the two collections of essays. 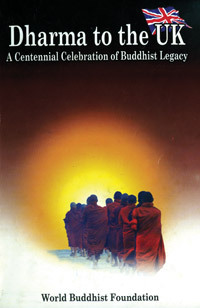 The first ‘Dharma to the UK – Centennial Celebration of Buddhist Legacy’ published by World Buddhist Foundation, and the second ‘Buddhism for the New Millennium’ published by Sri Saddhatissa International Buddhist Centre (10th anniversary celebratory Volume). The chief editors are the board of editors and the contributors should be commended for the careful selection of learned essays that has gone into the making of two lasting contributions and for tributes to the students, teachers and researchers in the field of religious studies. Taking a synoptic view of ‘Dharma to the UK’, the reader may come across 12 essays relevant to the subject. Out of these 12, my attention was drawn especially to two significant contributions. ‘Venerable Ananda Metteyya’s Buddhist mission to the UK’ by John Crow and ‘Ananda Metteyya: Contester of Misinterpretations of Buddhism’ by Elizabeth J. Harris. These two essays are significant, though I do not undermine the rest of the contributions. That being the rediscovery of the life, learnings, teachings, and the contributions of a long forgotten person, who was known as a laymen in England as Charles Henry Alan Bennett (1872-1923). The events that one comes across in this person’s life which paves the way for him to become a Buddhist monk named Ananda Metteyya look more moving like a sensitive human interest narrative. Alan Bennett, who had been quite physically sick, possessed an integrity with a powerful mind to overcome all sufferings which culminates in his effort to spread Buddhist doctrine to the West. His mission had been a great success, taking into account some of the historical facts such as the formation of the Pali Text Society (PTS) in cooperation with Dr and Mrs Rhys Davids, and the organization of the first Buddhist society titled as the Buddhist Association of Great Britain and Ireland. While he obtained the higher ordination (upsampada) during his stay in Burma he brought out the first pioneering magazine on Buddhism came to be known as ‘Buddhism: an Illustrated Review’. His lectures and the compilation of Buddhist pamphlets at times created a stir. He was also identified as a person similar to Colonel Henry Steele Olcott in our country. It is strange coincidence that Bennett had come to know Olcott, Besant and Blavatsky, a fact which had been middle in the annals of Buddhist history of both countries, Burma (now known as Myanmar) and Ceylon (now known as Sri Lanka). Apart from the contribution of Elizabeth Harris to the compilation ‘Dharma to the UK’, there is yet another article contributed by her to the other collection of essays titled as ‘The Power of Compassion: A Study of the Life and Thought of Venerable Ananda Metteyya’. The two essays written by the same writer contain various insights to the life and contributions of the Thera who led a noble life despite the sickness. I had the chance of reading both in English and Sinhala or these articles written to Budusarana. The original English works were later translated by the eminent translator Narawila Patrick. I feel that this was the opportunity the local reader had a glimpse into the life and works of Venerable Ananda Metteyya. This I felt as a remarkable starting point. All in all it is commendable that the reader is given the chance to search more about a particular subject area or a personality transcending the barriers of shallowness that paved the way to more and more ignorance. ‘Dharma to the UK’ too contains several articles: ‘Anagarika Dharmpala’s contribution to British Buddhism’ by Ananda Guruge (53-76pp), ‘Myanmar’s Contribution to Buddhism in the West’ by U Kolay and ‘Amaravathi in the Spread of the Forest Monastic Tradition’ by Robert Bluck. There are also several notes on aspects such as Buddhist architecture, Buddhist art and culture. Most references are attributed to the West with special reference to the UK. Venerable Galayaye Piyadassi states in the preface: ‘Research in Buddhist studies serves a core purpose adding new knowledge to the academic studies of Buddhism and enhancing the quality of human life in the social world. It is conceded that a higher form of creative thinking depends on the fountains of spiritualism devoid of mere apeing or imitation of threshold trends popularly acclaimed as ‘modernism’.